A couple of days ago, someone reached out to me via this blog. A client of his was in the market for a tier-3 certified data center in Nigeria and he wanted me to point him in the right direction. He had apparently read my data centers in Nigeria blog post of 2014 and assumed I could share some information about the landscape. He was reaching out from outside the country and was representing a foreign business with a massive footprint in Africa who wanted to use Nigeria as one of their disaster recovery locations – This makes a lot of sense on several levels. The truth, however, is that I had not updated my post in 4 years and a lot would definitely have changed since then – or have they stayed the same? The data center post continues to be one of the most read post on this blog and it is about time that it got updated. A comprehensive update like last time would take some time but in the interim here is my quick take on the current top data centers in the country right now. If you are in the market for a tier-3 0r 4 certified data center in Nigeria, the options are still quite limited. As at the time of this writing, there are only 5 providers in the country who have attained this certification levels – Mainone’s MDXi, Rack Centre, MTN Data Center, Galaxy Backbone, and DD West Africa Limited. DD West Africa Limited’s Cloud Exchange West Africa (CEWA) is reported to be building the first Tier IV data center in West Africa and while this is impressive, the current certification is still for the Design of the data center, it would be interesting to see how the data center evolves. I haven’t heard much about these guys besides that they used to be Dimension Data. I am also not sure if they have a constructed facility yet as i couldn’t really find concrete information on their website, so I will have to dig a bit more for my next article. Just so you know, all tier-3 data centers are not created equal. Service providers have to move across 3 stages from Design Documents to Constructed Facility and ultimately to the highest level of certification – Operational Sustainability. Design certifications are fine but when if you are a big player with mission-critical data, you need much more than just a design certification, this is where the other two stages come in. I won’t try to break the 3 stages all down here, you can read all about them on Uptime Institute’s website here but below is a quick summary about what I am talking about. Tier Certification of Constructed Facility ensures that your facility has been constructed as designed, and verifies that it is capable of meeting the defined availability requirements. Even the best-laid plans can go awry, and common construction phase practices or value engineering proposals can compromise the design intent of a data center. Uptime Institute’s Tier Standard: Operational Sustainability provides data center owners, operators, and managers with the prioritized behaviors and risks intrinsic to data center operations and serves as an essential guide for effective and efficient operations. Adherence to the recommended behaviors will assist in attaining the full performance potential of the installed infrastructure, reduce downtime risk, avoid costly errors, and uncover opportunities to increase energy efficiency. Currently, in Nigeria, we have 4 data centers that are Tier III certified for Design and only two data centers certified for Constructed facility. In my opinion, these are the data centers worth considering if you are serious about your operations and data. Up until just a few months ago, Rack Centre was the only data center in Nigeria certified for their constructed facility. MainOne’s MDXi got their certification in June 2018. There are currently no data centers certified for Operational Sustainability in Nigeria. 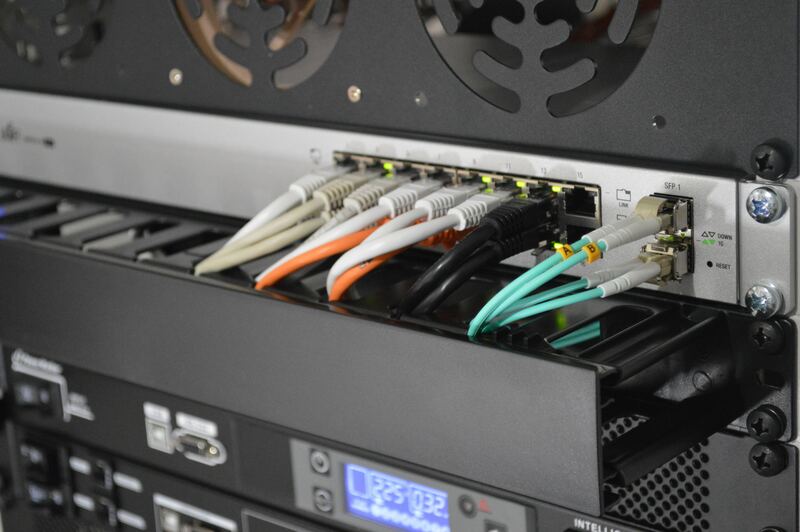 Rack Centre and MDXi both remain the best tier-3 options for colocation services in Nigeria. While Rack Centre was the first in West Africa to achieve Uptime Institute Tier III Certification of Constructed Facility, MDXi claims to be the most certified datacenter in Nigeria. Below are the findings of a simple Google search I just carried out now to review both providers. Apparently, MainOne had a major downtime for about 14 days as reported by this media outlet. 14 days is a long time to go down for any type of datacenter with actual clients. Will dig a bit more on this in my next comprehensive report. 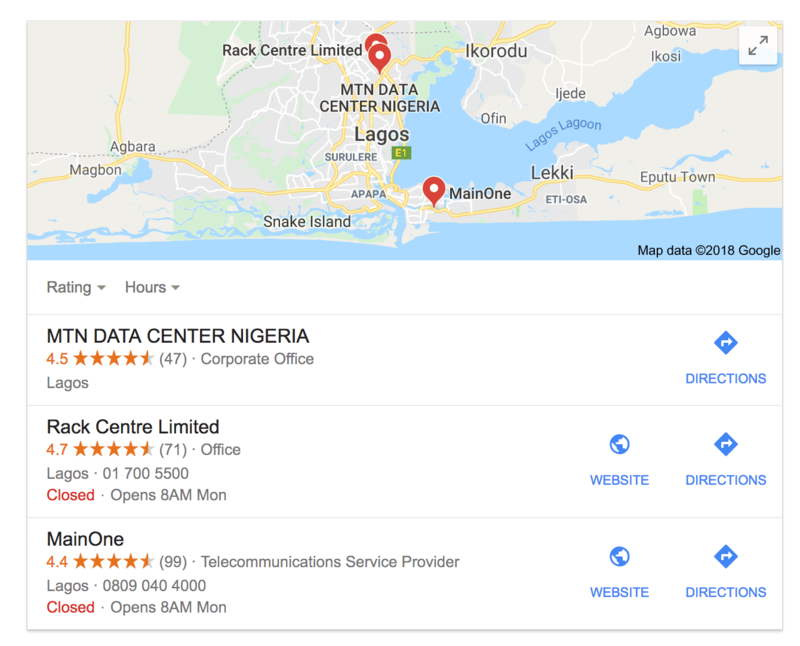 The image above is a result of a Google search for “data centers in Nigeria”. Only these 3 have taken the time to have their map information updated. MTN and Rack Centre are both located on the mainland while MainOne is located in the Lekki axis. Rack Centre returns the highest rating points while MainOne has the highest number of raters. There is a bit here to help with the decision making if you are in the market for a data center if you ask me. In my next post, I will share a number of questions you should consider asking when shopping around for a data center.